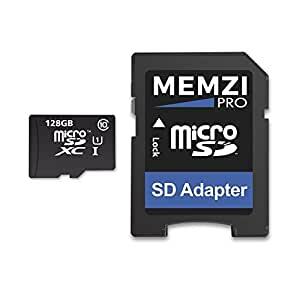 Memzi Pro Micro SD memory cards are ideal for use with all Smartphones, Tablet PC’s, Digital Cameras, HD Camcorders and all other Digital Devices that can use Micro SDXC Memory Cards. With a Class 10 UHS-I / UHS-1 specification and up to 80MB/s* transfer speeds they are designed to be used where fast memory cards are crucial, capturing High Resolution Images and Full HD video whilst ensuring smooth video playback without any lag or dropped frames. Ideal if you require a High Performance memory card for your Smart Phone, Phablet or Tablet PC. So the card can be used in different digital devices it comes with a Full Size SD adapter that you can slot your Micro SDXC card into then in turn the adapter into other devices that have a full size SD card slot. Supplied in sealed Green Packaging these Memzi Pro memory cards are Brand New and come supported by our 5 Year Warranty. *Up to 80MB/s transfer speed (write speed lower), based on internal testing; performance may be lower depending on host device. To ensure compatibility we recommend your device has the latest software or firmware version installed. SDXC memory cards can not be used in SD/SDHC compatible only Digital Devices or Card Readers.